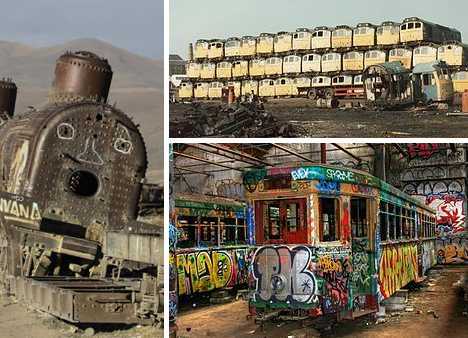 Where do obsolete trains go when they die? Many end up in railroad graveyards where these former station-stopping locomotives stay stopped and stationary. Vic Berry’s Scrapyard was a Leicester, England landmark from 1973 to 1991 when it was destroyed in a massive fire set by unknown, presumably train-hating, arsonists. Specializing in asbestos removal, Vic Berry’s set a standard for large-scale industrial recycling while its more well-known claim to fame was an immense pyramid of 30 disused Class 25 and 27 locomotives that reached its greatest height and breadth in 1987. Vic Berry’s Scrapyard’s reputation as a specialist in asbestos remediation was a double-edged sword. 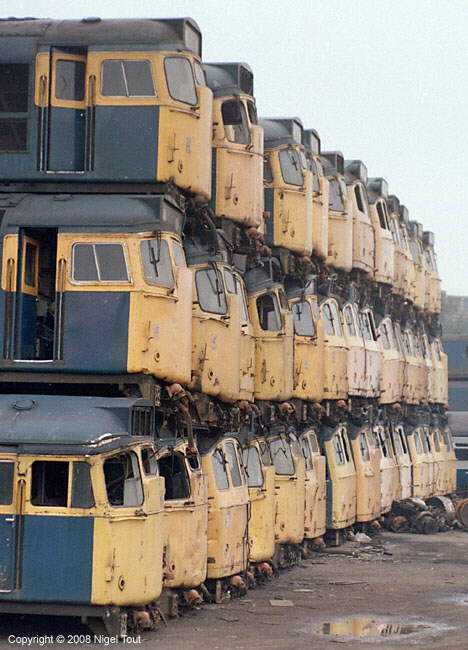 Firms eager to scrap old engines and passenger cars looked to the Leicester yard first, leading to a boost in business and a growing stockpile of non-rolling, asbestos-containing stock stored onsite. The worst thing that could happen was a large fire, and that’s exactly what DID happen in March of 1991. The blaze destroyed most of the yard’s stored stock and poisonous clouds of asbestos-infused smoke wafted across Leicester. The yard was subsequently closed and after a very long (approximately 5 years) and difficult cleanup, the site was redeveloped into the mixed use, residential and retail district of Bede Island. The ancient city of Thessaloniki, Greece is still thriving today, as is its train station. The trains, not so much… at least the older models dating back to the Steam Age when the city belonged to the Ottoman Empire. Why did these engines and coaches get the works? That’s nobody’s business but the Turks. The Sudanese city of Shendi has long been a regional trading and transportation hub so it’s no great surprise to see it’s got a respectable train graveyard in its, er, backyard. There aren’t all that many trains sitting in situ in Shendi’s shifting sands but to their credit, the variety of abandoned locomotives includes both early and modern types. Kudos to Panoramio user Wolodymyr for documenting a site (and a sight) very few might otherwise be aware of.